Eden's is a multi-faceted working vegetable production urban farm with training future farmers in mind. Farm operations include an on-farm Market Day, off-site farmer's market sales, CSA program, restaurant sales, charitable outreach/community garden, educational programs, eco-farm tour program, and off-farm events. Future plans include a year-round internship program; guest farming/crop-sharing; on-farm farm stand; fiber production; children's outreach educational program; eco-living and more! From bookkeeping, landscaping, picking, packing and weeding to planting and harvesting and assisting with the weekly distribution and market days, work share members can learn about the farm alongside the farmers in exchange for part of their annual commitment towards their share. WWOOFers and Interns will have the opportunity to learn about running an urban, sustainable farm while working alongside the farmer and in self directed activities in exchange for living accommodations & as available, commissioned sales at farmer's markets. We can accommodate 1-couple or 2 singles per season. 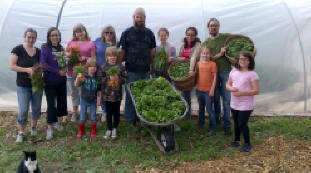 We welcome the opportunity to help others interested in learning how to grow food in harmony with nature through one of our various educational programs. Seasonal internships are available and acceptance will be determined after a resume review and interview process. (download internship description here) Resume should include a brief essay regarding motivation for this experience. Or emailed to info at edens organic garden center dot com. sign up for notices of special work days here!